Tuesday I posted Felix Frankfurter’s advice to a young man who expressed an interest in preparing for a legal career. What I find particularly interesting about it is the esteemed Justice’s view of what it takes to be a good lawyer. No one can be a truly competent lawyer without being a cultivated person. A good lawyer is a well-read person because that is the only way to acquire the capacity to use the English language on paper and in speech and with the habits of clear thinking, skills that only a truly liberal education can give. No less important for a lawyer is the cultivation of the imaginative faculties by reading poetry, seeing great art and listening to great music. The truly competent lawyer stocks his or her mind with the deposit of much good reading, and widens and deepens his or her feelings by experiencing vicariously as much as possible the wonderful mysteries of the universe. Early in my college career in Louisiana I announced my intention to go on to law school, and my father made an appointment for me to meet with a justice of that state’s Supreme Court for advice about the best course of study to prepare myself. The judge’s counsel was to get the broadest liberal arts education I could get, and to take courses that required writing and expressing my thoughts. He pointed out that the more exposure one is able get to the great ideas, to the history behind the way things are, to the principles that influence people in their daily lives, the better one can understand how to use the tools of the legal profession for the benefit of one’s clients. The law is a great profession, but it requires not only a knowledge of and skill in its practice; it requires that lawyers use it ethically to influence and hopefully improve the lives of clients, whom they must represent “zealously within the bounds of the law,” and the larger society. The lawyer who is well read and cultivated — to use Justice Frankfurter’s term — is the lawyer who is best equipped to meet the demands of the profession. Real property vests directly in the heirs in an intestacy. Parker v. Newell, 245 So.2d 575 (Miss. 1971). It vests in the devisees in a testate estate. Anderson v. Gift, 126 So. 656 (Miss. 1930). Also See, In Re Estate of McRight, 766 So.2d 48 (Miss. App. 2000). Even though the real property passes directly to the heirs or devisees, and not into possession of the Administrator or Executor (unless the Executor is directed by the will to sell the real property), it is subject to the claims of creditors and payment of estate expenses. The rules of abatement govern the order in which assetss of the estate must be first applied to such claims and expenses. Gordon v. James, 39 So. 18 (Miss. 1905); §§ 91-7-91 and -191, MCA. Authority to sell real property. When a petition to sell real property to pay debts is filed, all parties interested shall be cited by personal summons or publication. § 91-7-197. The burden of proof is on the petitioner to show that the land must be sold in preference to the personal property. Brown v. McAfee, 421 So.2d 1061 (Miss. 1982); Blum v. Planters’ Bank & Trust Co., 122 So. 784 (Miss. 1929). In such instances the Executor or Administrator would generally be the petitioner. A will may grant the Executor the express authority to sell the real property. Glidewell v. Pannell, 130 So.2d 288 (Miss. 1930). If the Executor under the will is specifically instructed to sell the real property, there is no requirement for court approval. Davis v. Sturdivant, 19 So.2d 499 (Miss. 1944). If the property has vested in the heirs or devisees, the Administrator or Executor should not sign the deed. See the citations above. There is no title in the Administrator or Executor to convey. The heirs or devisees sign the contract, exeecute the deed, and receive the cash proceeds. There are, however, two instances in which the personal representative will sign the deed. First, if the Executor is given the power of sale by the terms of the will, he or she should execute the will. Second, if the sale is by court order, the Executor or Administrator should sign the deed. §§ 91-7-187, -189, and -191, MCA. The practical effect of sale by court order is to divest the title out of the heirs or devisees, as the case may be. When real property is sold pursuant to a decree of the court, the Executor or Administrator shall execute a bond equal to the proceeds of the sale of the land. § 91-7-205, MCA. This code section does not apply to a sale by the heirs or devisees in whom title has vested. There is an exception to the requirement of bond. If the time within which all claims of creditors against the estate has expired, the court may waive all or any part of the bond when all the beneficioaries to the proceeds of the sale petition the court to authorize the sale and waive the necessity of a bond. § 91-7-205, MCA. If an Executor or Administrator fails to give the bond required, the court may direct a master to make the sale, and, after confirmation, convey the land. § 91-7-207, MCA. An early case held that failure to give the bond voids the sale. Buckner v. Wood, 45 Miss. 57 (1871). No one can be a truly competent lawyer unless he is a cultivated man. If I were you I would forget about any technical preparation for the law. The best way to prepare for the law is to be a well-read person. Thus alone can one acquire the capacity to use the English language on paper and in speech and with the habits of clear thinking which only a truly liberal education can give. No less important for a lawyer is the cultivation of the imaginative faculties by reading poetry, seeing great paintings, in the original or in easily available reproductions, and listening to great music. Stock your mind with the deposit of much good reading, and widen and deepen your feelings by experiencing vicariously as much as possible the wonderful mysteries of the universe, and forget about your future career. From THE LAW AS LITERATURE, ed. by Ephraim London, Simon and Schuster, 1960. A practice tip about trial factors is here. The factors that the court must consider in awarding child custody are set out in Albright vs. Albright, 437 So.2d 1003, 1005 (Miss. 1983). Age, health and gender of the child. Parent having continuity of care prior to the separation. Parent with best parenting skills and willingness and capacity to provide primary child care. Employment of the parent and responsibilities of that employment. Physical and mental health and age of the parent. Emotional ties of parent to child. Moral fitness of the parent. Home, school and coomunity record of the child. Preference of the child at age sufficient to express a preference. Stability of parent’s home environment and employment of each parent. Relative financial situation of the parents. Difference in religion of the parents. Differences in personal values of the parents. Differences in lifestyle of the parents. The Albright factors are not to be applied in the manner of a scoresheet or mathematical formula. Lee v. Lee, 798 So.2d 1284, 1288 (Miss. 2001). The Chancellor may give special weight to one, two or several factors to determine the outcome. Divers v. Divers, 856 So.2d 370, 376 (Miss. App. 2003). The Chancellor has the ultimate discretion to judge the weight and credibility of evidence. Chamblee v. Chamblee, 637 So.2d 850, 860 (Miss. 1994); Johnson v. Gray, 859 So.2d 1006, 1013-1014 (Miss. 2003). In an original action for custody, the Albright factors govern the award. That it is in the best interest of the minor child to change custody. Determination of the child’s best interest is based on application of the Albright factors to the facts of the case. The standard for modification is like a three-legged stool; if one leg is missing, the stool can not stand. It is a three-prong or three-part test. There is one exception to the three-part test for modification. In the case of Riley v. Doerner, 677 So.2d 740, 744 (Miss. 1996), the Mississippi Supreme Court held that it is not necessary to prove adverse effect where the child is in an inherently dangerous or unsuitable situation, as where the custodial parent is using drugs. Evidence of the Albright factors should still be offered in such cases. Some argue that Albright proof would not be necessary in a case where the proof shows a clearly dangerous circumstance, but it is this judge’s position that proof of the Albright factors in such a case would make the case airtight. There have been cases following Riley that have explained and even expanded on the concept, so that now there is arguably a “totality of the circumstances” test to justify modification. Some attorneys have taken the position that the “totality” is an alternative avenue to the three-pronged test. This court is not convinced, and takes the position that Riley and its progeny apply in extreme circumstances where the proof shows that the child is showing no adverse effects despite being in an inherently dangerous situation. In my opinion, the Riley line of cases is not intended to create a new remedy where there is no inherently dangerous situation and the proof is not strong enough to satisfy the three-prong test. The Albright factors apply only to physical custody, and the Chancellor is not required to address them in considering whether to grant joint legal custody only. Palculict v. Palculict, 22 So.3d 293 (Miss. App. 2009). The Mississippi Delta is the fountainhead of so much Mississippiana. The blues, of course, and I’m talking the birth thereof, as in Robert Johnson, W.C. Handy (sorry, Memphis) and Muddy Waters (aka McKinley Morganfield) among many, many others. Tamales even a Zapatista would revolt for. And, of course, Hoover Sauce. Yes, Hoover Sauce. As in that delicious sweet-salty nectar of the Delta gods, that marvelous concoction that, when used as a marinade, apotheosizes mere grilled chicken into a dish that will rival anything you will find on the menu at Galatoire’s or Antoine’s. Okay, I exagerrate. But I’m serious on at least one count: Hoover Sauce is some superbly good stuff. A good friend who loves great cooking sent me a quart that I have managed to put to good use, and I used the last of it tonight to marinate chicken thighs. Once again, as always, the results were scrumptious. Man, I have got to get me some more of this stuff. It’s sweet and dark, salty and tangy, garlicky and soy-saucy. The result is phenomenally tasty and flavorful. And chicken is only a start. I have read about folks using it on catfish, wild duck, pork, shrimp, and who knows what else … portobellos? doves? pineapple? taters? vegetables? The wondrous mixture comes out of the hamlet of Louise, Mississippi, in Humphreys County, which is the hometown (pop. 315) of Hoover Lee, a native of China, who invented the magical elixir and peddles it out of the Lee Hong Food Company in his town. There is even an official Hoover Sauce web site. I had planned to write an ode to Hoover Sauce, but Dixie Dining already did it here: Dixie Dining’s praise for Hoover Sauce. Are all necessary parties properly joined? Ward – petitions through guardian or next friend. Both parents, if living, are essential parties unless the child is placed under legal guardianship of one parent (e.g., by divorce) or of a third party. If neither parent is living and no legal guardianship has been established, a guardianship should be established before going forward with the settlement. Is there any need to join ancillary 3rd parties such as DHS or Worker’s Compensation Commission? § 93-13-59, MCA; Mississippi Bar v. Moyo, 525 So.2d 1289 (Miss. 1988). A guardianship is not required for settlements of money or property valued at $25,000 or less, and the $25,000 amount refers to the gross amount and not the amount due the ward after payment of legal fees and expenses. The court may, in its discretion, require a guardianship in any case, and in this court’s opinion, a guardianship should be required if the gross settlement settlement amount is $10,000 or more. § 93-13-211, MCA. The court must conduct a hearing regarding settlement of the ward’s claim, and a witness on the ward’s behalf must be heard. Union Chevrolet Co. v. Arrington, 138 So.2d 593 (Miss. 1932). The hearing must be had on the record. The court considers the evidence presented to determine whether the settlement is in the best interest of the child. The court may apply terms and conditions for holding the minor’s property during the period of guardianship. When a guardianship is established, annual accounts of receipts and expenditures are required unless excused by the court. A final accounting is necessary at the cessation of the guardianship. § 93-13-67 through -77, MCA. He had an unremarkable law practice in the backwater town of Maycomb, Alabama, in the 1930’s. He was a widower with two small children to raise, an earnest son named Jem and a tomboyish daughter named Scout. In one steaming southern summer his bravery and devotion to the rule of law elevated him into one of the most towering exemplars of integrity and the best of the legal profession. And yet, he never existed in real life. His name is Atticus Finch, hero of Harper Lee’s Pulitzer Prize-winning novel, To Kill a Mockingbird, which observes the 50th anniversary of its publication this week. The book is a powerful evocation of small-town life in the south in the sleepy, destitute era long before the civil rights awakening of the 1960’s. Rosa Parks had not yet sat in the front of a bus in Montgomery. There were no freedom riders then. No protest marches with German Shepherds and fire hoses. In the time of the story there is no political movement bearing the characters forward; there is only a black man wrongly accused and this small-time lawyer in a “tired, old” Alabama town doing what his profession and his own personal convictions demanded of him, and doing it with honor, courage and single-minded devotion to the interest of his client, heedless of the personal danger that his unpopular actions brought him. And through it all Atticus Finch the lawyer was a wise, attentive and devoted father and rock for his children. To many of us, Atticus Finch is inescapably Gregory Peck, who played the role in the 1962 film and won an Oscar as best actor. The movie won three Academy Awards out of eight nominations, and today is considered one of the great American classics. Its black-and-white images remain etched in our minds. 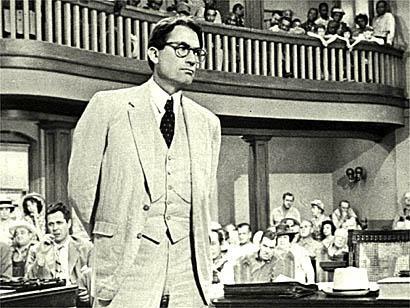 I am sure that I am not the only southern teenager who saw the movie in those days and was inspired to be a lawyer just like Atticus some day. Half a century after he appeared, Atticus Finch remains a model and a contemporary inspiration. In a recent poll practicing lawyers voted him an influence on their careers; strong stuff for a fictional character. Habeas corpus is the ancient writ that extends ” … to all cases of illegal confinement or detention by which any person is deprived of his liberty, or by which the rightful custody of any person is withheld from the person entitled thereto …” §11-43-1, MCA. In Chancery Court, habeas is most often used where one person is withholding custody of a child or a ward from the person who is legally entitled to custody. This post will focus on Chancery cases involving deprivation of custody, and not on illegal detention by the state. The procedures for habeas are purely statutory, and are specifically excepted from Rule 81, MRCP. The first step in obtaining the writ is to file a petition with the court. The petition must be sworn, describing where and by whom the person is being detained, the facts and circumstances of the restraint, and the ground for the relief sought. §11-43-9, MCA. Venue is proper in the county where the person is being detained, not in the county where a prior judgment of custody was entered. Logan v. Rankin, 230 Miss. 749, 94 So.2d 330 (Miss. 1957). Next, the petition is presented to the court. Some judges require that the petitioner appear personally to testify in favor of granting the writ. This judge will issue the writ without testimony of the petitioner if the petition is in proper form, is sworn, and includes each and every element required in §11-43-9, MCA. If the Chancellor deems the petition adequate, he or she will sign an order directing the clerk to issue the writ. The Chancellor may issue the writ also. §11-43-15, MCA. WE COMMAND YOU to have the body of ___________________, by you detained, as it is said, before __________, a judge of our _____________ Court, at _____________, forthwith (or on a given day), to do and receive what may be then and there considered concerning him. Witness my hand, etc.” §11-43-17, MCA. The writ is served, and the return made, as with process, by any person whom the court may direct or by the sheriff or any constable. §11-43-17, MCA. The person upon whom the writ is served is required to have the person for whose benefit the writ is issued personally before the court at the appointed time. §11-43-27, MCA. The court may, however, order immediate apprehension of the person in whose behalf the writ is sought, if the court is satisfied from the sworn allegations or testimony that the person will be removed or concealed so as not to be produced with the writ. The sheriff or designated person in such a case is directed to take the person into custody and to deliver the person to the court at the appointed place and time. The statute sets out the required language for the writ in such cases. §11-43-21, MCA. The writ may be served on a Sunday in event of an emergency. §11-43-21, MCA. The writ is returnable forthwith, or on a particular day within a reasonable time. §11-43-23, MCA. §11-43-31, MCA, sets out penalties for disobedience of the writ. The respondent who disobeys the writ may be ordered to pay the person for whose benefit the writ is issued a penalty of $1,000, and the disobedient party may be punished for contempt. §11-43-31, MCA. At the time set for return of the writ, unless the detaining party agrees to release the person detained, a hearing is held to which witnesses may be subpoenaed, and testimony and evidence is taken as at other trials, and the court may continue the case from day to day as the case may require. §§ 11-43-33 and -39, MCA. Interestingly, testimony of a witness may be offered by affidavit “whenever the personal attendance of a witness can not be procured,” provided that the affidavit is taken on reasonable notice to the other party. §11-43-39, MCA. The court may award “costs and charges, for or against either party, as may seem right.” §11-43-33, MCA. The court may make temporary orders. §11-43-35, MCA. The court’s judgment is final, binding and appealable. §§11-43-43, -53 and -55, MCA. The habeas court does not have continuing jurisdiction to modify its award. See, Mitchell v. Powell, 179 So.2d 811 (Miss. 1965). The jurisdiction of the Chancery Court in a habeas proceeding is temporary in nature. See, Pruitt v. Payne, no. 2008-CA-00172-COA (Miss. App. 2009). Habeas is not to be used as a mechanism to modify prior custody decrees. Fulton v. Fulton, 218 So.2d 866, Miss. 1969). In the case of Wade v. Lee, 471 So.2d 1213, 1217 (Miss. 1985), however, the Mississippi Supreme Court carved out an exception so that the petitioner or respondent may use a habeas hearing to obtain temporary custody if the custodial parent has abandoned the child or become “altogether unfit” to have custody. In such a case, the court should set an expiration date for the temporary order in order to give the parties an opportunity to file appropriate pleadings for modification in the court having jurisdiction to entertain the case. An observation: It is unfortunately frequent that attorneys come to a habeas hearing and try to present a modification case, with its evidence of material change, adverse effect and best interest. The proper standard in a habeas hearing to achieve a temporary change in custody, however, is to produce proof that the custodial parent is “altogether unfit” or has abandoned the child, and proof that falls short of that standard will result in the child being returned to the custodial parent. If the proof only supports a modification action, that is the procedure that should be used, and not a habeas proceeding. You are currently viewing the archives for July, 2010 at The Better Chancery Practice Blog.